“Judith was left alone in the tent with Holofernes sprawled out on his bed, dead drunk. Now Judith told her servant to stand outside of the bedroom and to watch for her to come out just as she had done on other days. She said that she would be going out to pray, and she told Bagoas the same thing. So everyone went out, and there was no one left with them in the bedroom, either small or great. Then Judith stood next to his bed and said in her heart, Lord, God of all power, look at this hour upon the work of my hands for the glory of Jerusalem. Now is the time to help your inheritance and to accomplish my plans to destroy the enemies who have risen up against us. They escape and the Assyrians who have lost their leader, disperse, thereby ending the siege. The story has been the subject of many paintings due to its heroic content and the dramatic culmination of the beheading. 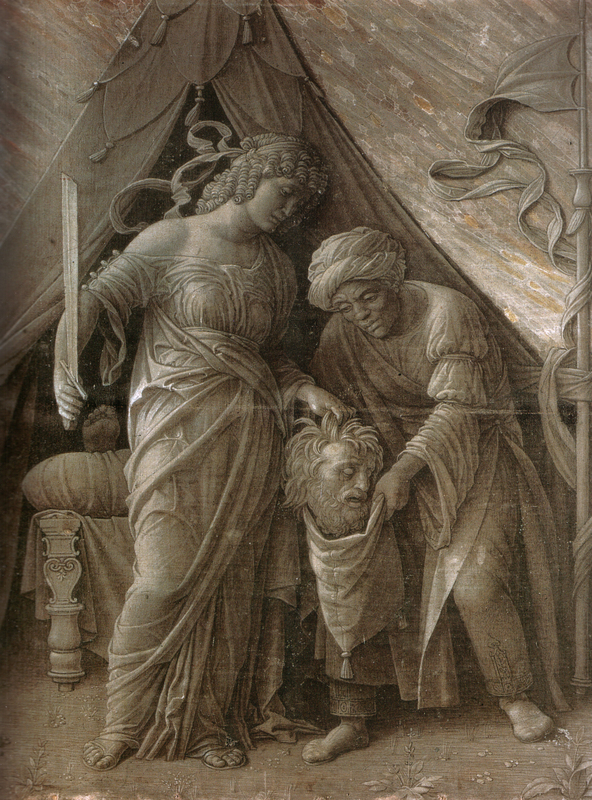 Like his Samson and Delilah, Mantegna chose to paint it looking like it was cut in marble. At 48.1 x 36.7 cm. it is relatively small but incredibly detailed. 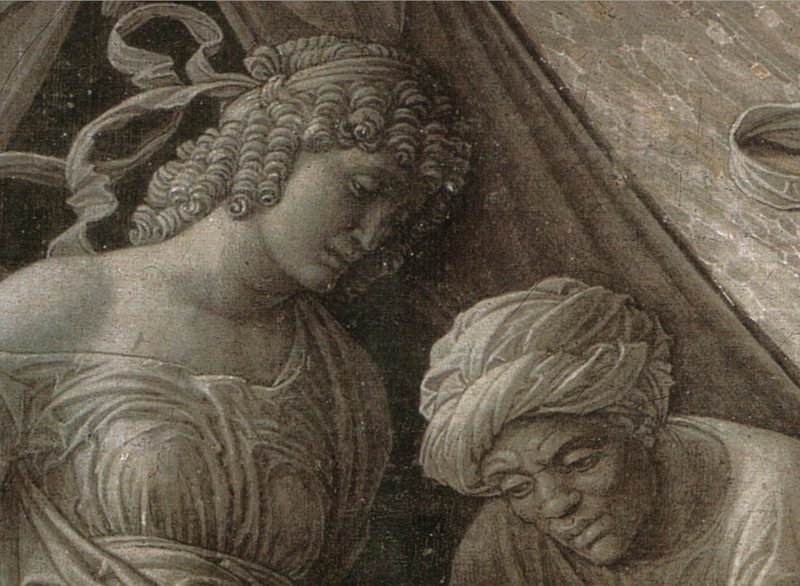 Look at the detailed hair of Judith and the fabric of their clothes. Mantegna made the background on the right look like marble as if the painting was sculptured out of it. 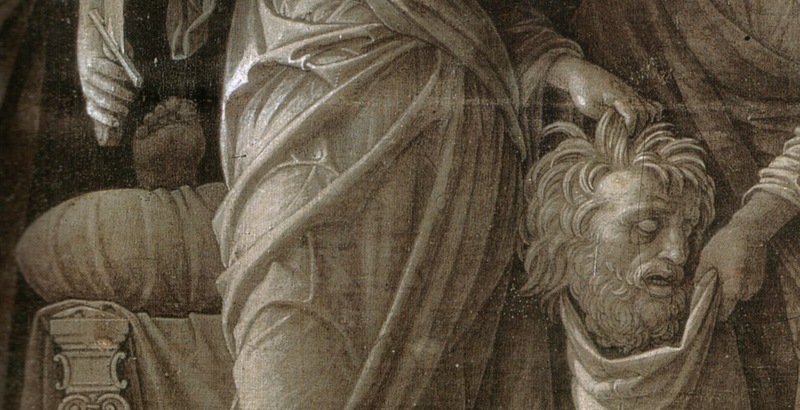 A macabre detail: just to the left of Judith’s hand holding the sword, we see a foot belonging to Holofernes’ body lying on the bed.